Pingo - The Pink Penguin: Copyright update and important note to the customers from the European Union! 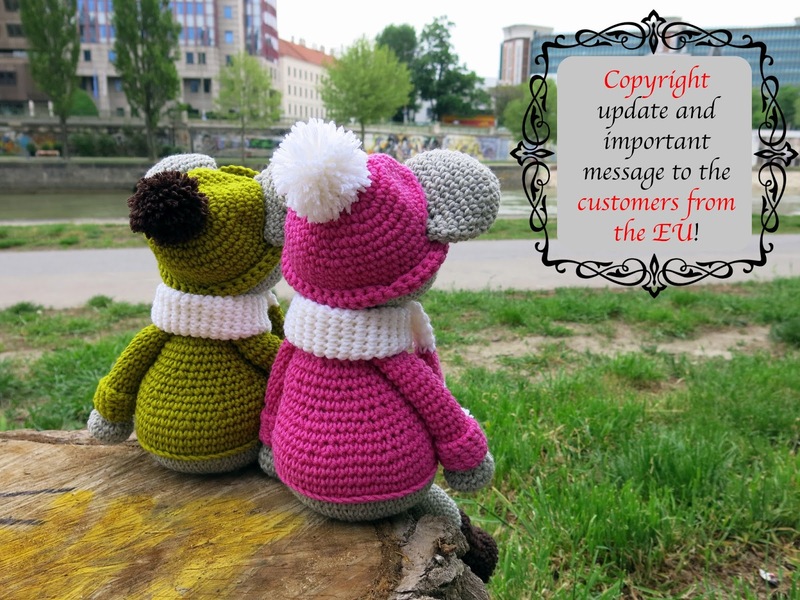 Copyright update and important note to the customers from the European Union! As many of you asked and insisted on selling the items made from Pingo's patterns I had to reconsider my initial decision... From now on you are allowed to sell finished items (not the patterns or parts of them) made from Pingo - The Pink Penguin patterns, but in limited number (no commercial use). If you are going to sell the finished item on Internet, please give a credit to Pingo as an author of the design and a link to the Facebook page, the Blog or the shop from which you've downloaded the pattern. Additionally to that I have an important note for our customers from the European Union. Since 2015 there is a new Regulation from the European Union, which says that VAT (Value Added Tax) should be added to the selling price of a digital item. Shortly said - the items will be increased with the VAT percentage of the state of your (consumers) residence. We will decrease our prices, so the gross price for the end-customer won't change. We can't do that however for the items sold in Etsy, as with the applying of this regulation, Etsy did not give any option to adapt the gross pricing accordingly. This is being a combined result of the Regulation and the way Etsy adapted their service towards end-consumers. This is the reason, why I can only advise you to buy the patterns from the Ravelry shop. All other customers (outside the European Union) should not be affected by these changes. I wish you a wonderful and relaxing weekend!